As a special education teacher, my students struggle with answering a text dependent question. I wrote this song to teach my students the steps involved. 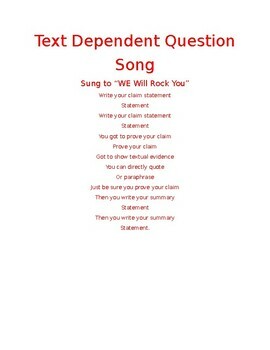 It follows the tune of "We Will Rock You". My students keep the beat with their hands as we sing this tune. I have seen an improvement in their understanding of how to respond to text dependent questions.